Airbus an aerospace firm has presented the Airbus Racer a revolutionary helicopter concept of the future it says will be capable of flying at the speed of 400km/h at the Paris Airshow. The Racer concept based on X3 prototype helicopter, which sets a speed record at 255 knots in level flight in 2013 of the same company, but with improvements in its design and components. The primary focus would be the addition of wings that, together with its propellers, would allow it to reach the High speeds. The Airbus Racer is made up of the main engine located at the top, like any standard helicopter, but once it has taken off, this engine would decrease its power in support of the side propellers of the wings it can propel the aircraft at high speeds. If we see it in a way, it looks like a crossbreed between airplane and helicopter. 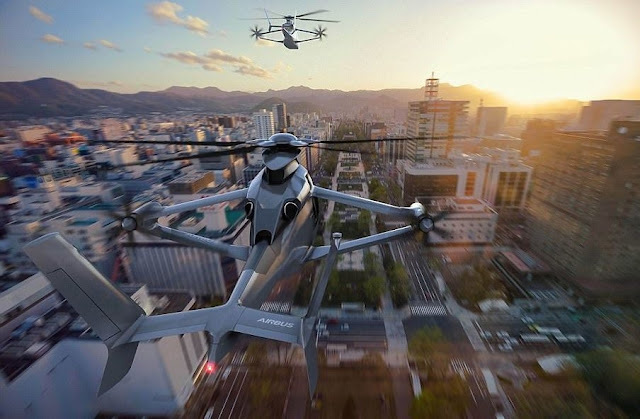 Airbus says it could revolutionize everything from air ambulances to private travel, it will be ready in 2019, and the first test flights will be made just a year later, in 2020. The Racer demonstrator will also benefit from a hybrid metallic-composite airframe, specially designed for low weight and low recurring costs. This unique project, drawing together the skills and know-how of handfuls of European partners through the Clean Sky 2 initiative, intends to bring high speed and range at the reasonable expense, gratitude to a convenient, reliable and proven aerodynamic formula. Wonderful post yar, I was searching about fastest helicopters. This popped up, well written.